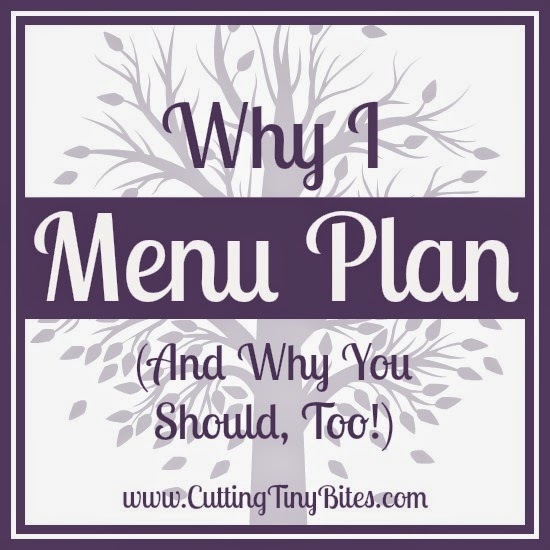 There are lots of posts from other bloggers about menu planning. If you're interested in beginning to menu plan, chances are you'll read through several of those posts until you find a system that seems like it will work for you, or a voice that you can relate to. The truth is, there isn't one single way to menu plan that is right for everyone. Nor is there one single reason why you should menu plan in the first place. Years ago, I never planned my menu. It was just my husband and I, and it didn't really seem necessary. We would both work all day, and then 5:30 or 6:00 would roll around and we would be hungry and ready for dinner. We'd stare into the fridge. We'd look in the pantry. 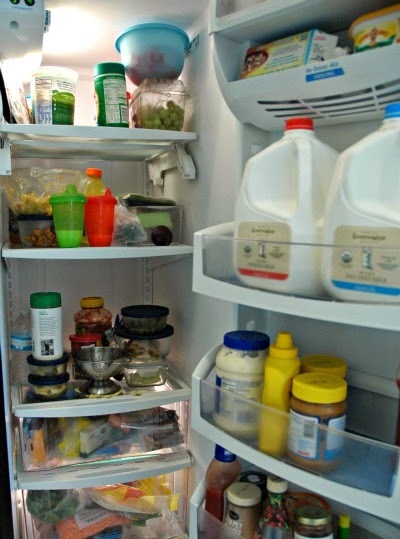 We'd open the fridge again. Then we'd throw in a frozen pizza or make a box of mac and cheese. Maybe I could cobble together something that resembled a recipe. Or, we'd grab takeout that we'd eat together as we sat on the couch. It seemed like my "system" (and by that I mean lack-of-a-system) was working fine. We ate something every night, after all. Then I became pregnant with Lena. One day at work, I made a comment to a close friend that revealed our evening dining habits. She wheeled me around, looked me straight in the eye, and said, "Ellen, you cannot do that once that baby comes. You've got to get it together." This woman was no nonsense, and I looked up to her as a mentor. I took what she said to heart and knew that she was right. By the time Lena was born, and when she was a little baby, I usually had a vague idea of what we'd be having for dinner each night. But it didn't always work. I'd forget to shop for something, or wouldn't get something prepped in time. After a few months, I had a frustrating moment where (AGAIN) things just hadn't come together for dinner. I wondered what the problem was-- I had always been successful at work, and never had a problem getting things done. I realized that I didn't feel any real sense of accountability. No one except my husband would ever know if I didn't make dinner, and he was happy to eat sandwiches for dinner. But I knew that I could do better, and I knew that as my family grew it would be increasingly important for us to sit down together for a real meal. So I just committed to DO IT. It's taken some time, but these days menu planning and dinner prep runs pretty smoothly around here. There are so many benefits to planning your menu! Here are the reasons why I started and continue to plan our menu ahead of time. When I've taken the time to make a meal, we sit down at the table together and eat it. Otherwise we'd all just eat when we could and might not make it to the table at the same time. Dinner is an event, sort of the linchpin of the day, and we have valuable family time during dinner. It was sort of fun, in the old days, to wander the grocery store aisles and browse and buy whatever I felt like. But now, I've got 2 young children. They're either with me when I shop, or I'm using up precious alone errand time while I get groceries. Either way, I want to get in and out of the store quickly, which means that I need a list and a plan ahead of time. We live on one income. We simply cannot afford for me to grocery shop according to my whim and then have lots of food end up in the trash because I didn't have a plan for it, or because I didn't get around to cooking it in time. You and your family deserve better than frozen pizza and boxed mac and cheese. Most healthy food requires some planning and preparation. You've got to actually buy fresh fruit and veggies, and then use them while they are still good. When you look at a whole week or whole month of meals planned out, you can ensure that you're not having too much pasta or too much beef or too much whatever. You can easily see that you've planned enough variety of veggies, proteins, styles, and preparation techniques. You can also make sure that you've got some of everyone's favorites and some dishes that will require your little ones to stretch their palates. If I want dinner ready at 6:00, and won't be home until 5:45, then I have to plan to either have leftovers or have someone else put a casserole in the oven for me ahead of time. If I'm making a soup with lots of veggies, I need to chop them during the girls' nap time (anyone with young'uns knows that everything becomes more difficult during the 'sour hour' of late afternoon). If my husband is having barbecued chicken, I need to pull out a chicken breast to thaw the night before. You're going to eat dinner, and your kids are, too. If you don't have something planned to cook, and you don't actually cook it, you're much more likely to get takeout or go to a restaurant. And ANY takeout or restaurant meal is more expensive than something you can cook at home. What other reasons can you think of to add to this list? Tell me in the comments below! Why bother with menu planning? Here's a list of GREAT reasons!